“Habemus Campione” said the banners attached to large crest imitating one of Vatican. Then came the smoke. A real mass of smoke from pyrotechnics that covered the stadium in thick fog for some 10 minutes. That’s how Legia Warszawa supporters celebrate their double triumph – domestic league and cup. With an attendance record as well. It’s Legia’s 9th Polish championship and first one in 7 years. To add to that, they also won the Polish Cup in the greatest final in decades, seen by over 60,000 people. And to make it even more thrilling, their last game of the season was one against last year’s champions (reigning until the 90th minute) and Polish Cup final rivals – Śląsk Wrocław. 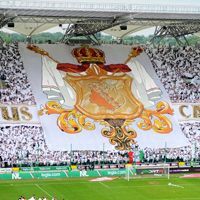 All this together with Legia supporters’ fame for vocal power and large displays at Stadion Wojska Polskiego in the stands resulted in a huge show that made the game delayed for 15 minutes. Expected to start on 4pm, the match didn’t kick-off as planned despite players having entered the pitch early. As they came out of the dressing rooms, the whole stadium got covered in white, with thin strips of green and red, all created with balloons and some small flags. North end unveiled banners saying “Habemus Campione” with a large crest imitating that of the Vatican, referring to the process of papal selection during the conclave. After the club anthem explosions started to spread as fans started piercing their balloons. Then streamers flooded the pitch, perhaps the only element that didn’t go as planned due to lack of coordination. Still, this required quite some cleaning before the referee could even consider blowing his whistle. And before he did, fans at the north end rolled their banners and made the stadium explode with pyrotechnics. Where there’s conclave, there has to be smoke. It was both white and black, this time. And there was enough of it for broadcasting network TVN24 to give live coverage of the stadium seen from a helicopter, resembling a boiling cauldron. It wasn’t until 4:15 that the game could actually begin. But when it did, Legia fans got more than they could wish for with their side smashing reigning champions Śląsk 5:0, proving they deserved to be leading the table throughout the ended season. As if this wasn’t enough, another memorable figure came today as Legia supporters set a new attendance record of 30,787 people, exactly one person more than 2011’s clash against Rapid Bucharest in Europa League. This would not happen if Śląsk supporters were present, but as they’re punished for violence with a month long away travel ban, Legia fans were also able to fill the away section today.